The Assassination Rogue is the master of poisons and, in Legion, bleeds. At the start of Legion they were a bit behind Outlaw Rogues as top damage dealing Rogues, but a patch/hotfix will probably have changed that by the time you read this. Updated for Warlords of Draenor with some Legion changes, more coming soon. – see below the table of contents for a few of the Warlords changes. This Assassination Rogue guide is primarily intended for use at level 110. However, the principals will still apply during the leveling process. If you’re looking for advice on leveling your Rogue, check out our Rogue Leveling Guide. See our Rogues in Warlords of Draenor post for more details. Redirect is dead and your Combo Points stay with you. This makes things more consistent with other classes that have some form of points to build up and will make your target switching easier. Agility no longer adds to crit, but all Rogues (and all Agility classes) get a bonus 10% to Crit. Stats: Your Hit, Expertise are both gone, and so is Reforging. You will have to stack stats the old fashioned way, though gear choices, enchants, and gems. You also have two new stats, Versatility and Multistrike. The former improved everything you do (damage and defense) while the latter gives you more strikes (and more DPS) over time. Garrote no longer triggers Venomous Wounds. The Paralytic Poison talent is gone, replaced with Internal Bleeding. This will be a DPS add on anything that you can hit with your Kidney Shot. New level 100 talents, perks, etc. Our talent picks are checked: Many of the talents provide little in the way if increased DPS, but some will greatly increase your life expectancy, since dead Rogues do no damage. Master Poisoner – 30% more damage from your poisons and better effect from the non-lethal parts. Constant added pressure from your poisons without having to do anything fancy. Not so hot for raiding. Elaborate Planning – your finishers add 12% bonus damage to all strikes for the next 5 seconds. A passive ability that generally increases your damage. Hemorrhage (stolen from Subtlety) – Medium strike that increases bleed damage from your other strikes for 20 seconds. You will need to keep this applied to any target suffering from one or more of your bleeds. Nightstalker – In stealth you move 20% faster and do 50% more damage. More speed is always useful as is more damage. Subterfuge – Use stealth abilities for 3 seconds after leaving stealth. Also adds 100% damage to your Garrote and removes the cooldown from that ability if used in stealth or in that 3 second window. Allows Cheap Shotting or Garroting two (or three) opponents, time and energy permitting, but that’s less useful in PvE than in PvP. It also keeps you from being immediately knocked out of stealth by certain effects. You will still have that 3 seconds to do your opener. Shadow Focus – Abilities used while stealthed use 50% less energy. The cheap opener lets you more quickly move into the rest of your rotation. Deeper Stratagem – Passive. You can now store and use up to 6 CPs on your finishers, plus your finishers do 10% more damage. This will be the usual choice. Leeching Poison – this poison gives you 10% Leech for one hour. This is a decent pick if you’re only taking light damage throughout the fight. It’s a weaker choice than the other two. Elusiveness – Your Feint now works for all damage, reducing it by 30%. It still reduces area damage by 50%. This will be the choice for fights with unavoidable incoming damage. Cheat Death – Yes, Rogues cheat. If you’re hit with a one shot kill you will instead be reduced to 7% health and take far less damage from all attacks for three seconds. Won’t happen more than once every 2 min. Prey on the Weak – Passive. After you use certain incapacitating strikes your opponent will take 10% more damage from all sources. Kidney shot, Cheap Shot, Sap, and Blind (Assassination no longer has Blind.) Doesn’t work if the target is immune to those abilities. Internal Bleeding – Your Kidney Shot also bleeds to opponent over the next 12 seconds. Note that it does nothing to targets that are not affected by your KS, such as bosses. It does a lot of additional damage otherwise, so becomes quite useful when fighting trash. Agonizing Poison – does not do damage directly, but rather increases the damage that you do from any of your other abilities and can stack up to 20% extra damage. Venom Rush – your Venomous Wounds ability grants more energy and being the somewhat energy starved assassin that you are this is a pretty nice thing. Death from Above has a 20 yard range, hits all mobs around you, and drops your damaging finisher on the main target with 50% bonus Envenom damage. Note that it’s also a nice gap closer. Glyph of Disguise – Copy your target’s appearance for a few minutes. Glyphs in M of P come in 2 flavors, Major and Minor. Majors provide significant changes to abilities, minors are mostly just cosmetic. In addition, there are very few glyphs, for any class, that are always the “best.” For optimal performance you will be doing some glyph switching. As with talents, you will need one Tome of the Clear Mind for every change. In Warlords you automagically learn a number of glyphs in the same way that you learn your abilities. You still need to instal these glyphs, you just won’t need to buy them. All Rogues learn these glyphs. In addition, some glyphs are exclusive, meaning that you can load two exclusive glyphs at once. And example being the glyphs of Recuperate and Recovery. Pick one. Glyph of Vendetta – Trade a little less damage for longer duration. Nice for long fights with no target switching, where it will be a DPS increase. If you won’t be sticking to the boss for at least 30 seconds then take another glyph. Glyph of Disappearance – More Vanishes for more openers. Glyph of Feint – Increases duration, which has it’s uses. Glyph of Smoke Bomb – a useful defensive cooldown for your melee group. Glyph of Energy – Need more energy? Here’s +20. Glyph of Recovery – More healing from other sources, such as your healers. This is only useful if your healers actually need the help, as CPs spent on Recuperate are not doing damage. Glyph of Sprint – Faster Sprint movement and will cover more distance. Exp. take this if you don’t take the Bust of Speed talent. Glyph of Evasion – Survivability boost. Glyph of Cloak of Shadows -Survivability boost. Deadly Momentum nice when fighting trash as your Slice and Dice and Recuperate won’t need to be refreshed. Glyph of Blurred Speed – Run on water. Warlords note: Hit, Expertise,and reforging are all dead and gone. In their place you have two new stats, Multistrike and Versatility. Both of these stats are net DPS adds, but how they stack up to other stats remains to be seen. Legion: No new stats, Multistrike is gone. “Attuned” stats are also gone. Versatility remains. Agility is your best stat, adding to all damage and adding a bit to your crit rating. Mastery is a straight up poison damage increase. The more the better. *Note: 1% of Versatility is better than 1% of Mastery (assuming that your poisons don’t get a big buff,) but for 400 points of each (at 110) you get about 5% Mastery and about 1% Versatility. (I asked Mr. Robot.) So even if Vers. is twice or three times as good, it isn’t 5x as good. This assumes that your poisons, in any given patch, are doing more than trivial damage. IF, as was apparently true at the end of the beta, the poisons are trivial, then go with Versatility. How to tell? Check your Recount stats. If your poison damage is tiny, relative to everything else, then even the better Mastery scaling won’t do enough. If it’s competitive, then go with Mastery. I’ll probably change this if sims show poison damage to actually be trivial. Multistrike: Grants two chance for spells and abilities to fire an additional time, at 30% effectiveness (both damage and healing.) Your Multistrikes can apply poisons and can Crit. In PvP there is only one chance. Versatility: Increases damage, healing, and absorption done. Reduces damage taken. It’s a straight up bonus to any damage that you do, whether poison, bleed, strike, or whatever. Crit – Your Seal Fate ability will give you an extra Combo Point whenever you crit. Crits do 150% damage in PvP, 200% everywhere else. Haste speeds up everything you do, including energy regen, poison procs, etc. 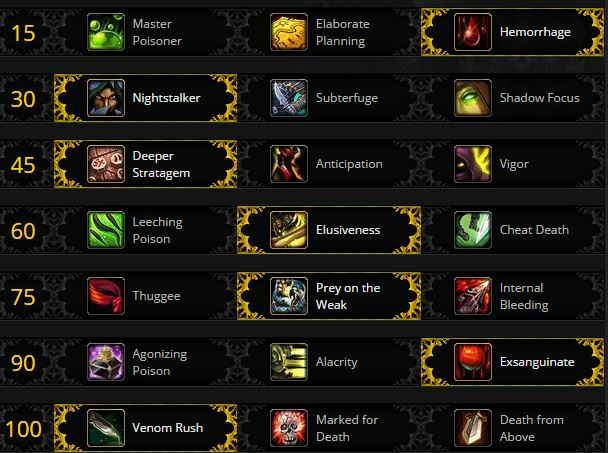 Not as good as Mastery unless you have multiple items that have procs, such as the trinkets mentioned below. Deadly Poison (DP) should always be active as your Lethal Poison of choice. Make sure your DP doesn’t fall off, it will be a huge DPS loss. The level 90 talent Agonizing poison replaces your Deadly Poison. If you took it then Leeching Poison is the recommended Non-Lethal Poison, otherwise use Crippling. The other non-lethal poisons have been removed from the game. For most situations it won’t matter which one you use. At level 98+ your Slice and Dice is passive, due to a perk, hence it’s not mentioned in the rotation below. As an Assassination Rogue your rotation primarily revolves around the use of Combo Point generating attacks followed by expending those Combo Points either to maintain buffs, deal immediate damage, or apply a debuff to your target. A very large portion of your damage will come from your Deadly poisons. Mutilate is your primary combo point generating attack and first priority when a target is between 100-35% health. Your Seal Fate ability will give you extra CPs occasionally. Keep Rupture up on your target at all times, this will account for a lot of your Energy return, as well as added damage. In Warlords your Venomous Wounds only functions with Rupture, it no longer works with Garrote or any other bleed. Use Envenom, preferably with 5 Combo Points, when Rupture is applied and Slice and Dice is active to deal damage and refresh Slice and Dice. The Envenom buff will also increase your poison damage. With the Anticipation talent you should always use 5 pt Envenoms. The Marked for Death talent can be used to get an extra finisher, especially when fighting several targets. A of E: When facing targets numbering more than 6 begin using Fan of Knives as your primary attack ability. Combo Points now stay with you, not the target, so when the target dies and you have x CPs available you can immediately put them to use on the next target. Redirect is no longer necessary and has been removed. Vendetta increases your damage done to a target by 30% for 20 seconds or 25% for 30 seconds if you use the glyph with a 2 minute cooldown either way. Use this ability as often as possible assuming you’ll be able to stick to the boss for the full duration. Rupture‘s damage is increased and has a 100% chance each time they tick on a target to restore 10 energy due to Venomous Wounds. Relentless Strikes gives your finishing moves a 20% chance per combo point to restore 25 energy. Feint, Cloak of Shadows and Evasion are all potent survivability tools which should be used when you feel the need. Feint will allow you to tank AoE effects to some extent. Cloak of Shadows lets you completely negate chunks of magical damage and can also be activated to drop particularly harmful debuffs. Evasion is only useful when facing attacks where you can benefit from the increased dodge, such as when fighting an add. Tricks of the Trade no longer provides any damage increase, it only transfers threat. Since it’s unlikely that you will be able to pull aggro from the tank you will find little use for this ability. Use Vanish as often as possible to enter stealth and take advantage of the Shadow Focus talent for a nearly energy free Mutilate/Ambush. Leeching Poison is your Non-Lethal Poison of choice, though Elusiveness will have occasional use. Marked for Death can be used for an immediate 5 point finisher when you need it.Nice for that Rupture or an additional Envenom. Go here if you need more gold to buy gems and stuff. Your leather bonus adds to the agility numbers of any gems and enchants. 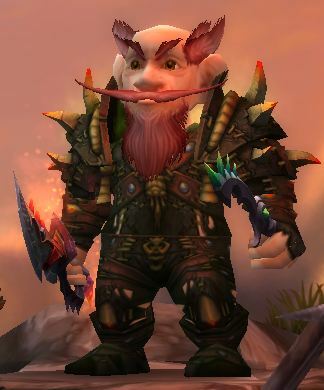 Gemming before Warlords: Assuming you want to gem any socketed gear you find before you get into the level 100 gear…. You do want to match for the socket bonuses in all cases. Gems sockets have a (small) random chance to appear on Raid and other gear, they are not as common as before. There are no meta gems or meta sockets, there are no socket bonuses, and all sockets are “prismatic,” which means that they will take any available gem. Gem for Mastery (or alternate Mastery and Crit) in all slots. Earloer enchants are shown if you want those enchants on gear under item level 600. Remember that top level enchants can be added to low level items, such as your heirlooms at level 1. Short on gold? If you want to buy the best enchants, fund all of your alts, donate to the guild, etc., but don’t have the cash, then see what the Tycoon Addon can do about about improving your situation. Pandarens get double food buffs. In Warlords there are no high level foods that add primary stats (Ag, Int, etc.) Food buffs go away after an hour or if you’re killed, so remember to refresh. Warlords did away with any racials having to do with Hit or Expertise. Most of those were replaced (not for Orcs) and all races now have an ability which adds at least a bit to DPS. Can be either Horde or Alliance, you choose when you leave the starting area. Melee range stun (4 seconds) is a nice ability. Better buffs from food, for more Agility from that last meal. They take less falling damage, which has very limited use in PvE. Increased Haste, which is a decent stat for you. Rocket jump is much like the Mage’s “Blink,” and has definite escape use in PvP and certain PvE situations. It breaks stealth and can be a useful gap closer. Blood Fury is a very useful DPS ability since it’s a cooldown. Resistance to stuns has very occasional PvE use. A decent DPS cooldown, Berserking, provides 20% attack speed every 3 minutes. 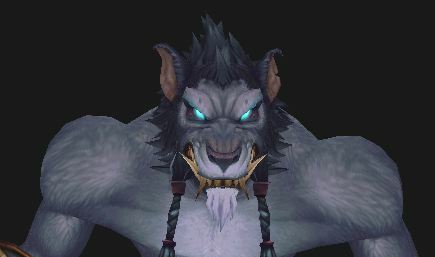 Trolls also have reduced snare/root duration which has PvP and occasional PvE use. If you’re leveling then you might like to know that the trolls get extra XP for killing beasts. Arcane Torrent generates some energy every 2 mins. and does an AoE silence (also interrupts non-player targets.) This gives it both PvP and PvE use. Useful when fighting caster trash. Touch of the Grave is a passive Drain Life ability which heals you for the amount that it drains. This is a small DPS add. Will of the Forsaken could allow you to deal some extra PvE damage by washing away applicable boss mechanics. Indefinite Underwater Breathing probably has zero PvE value. the 1% add to crit rating is the best of the Alliance DPS racials and has some PvP utility. The run speed special has situational PvE use and greater mobility is always nice in PvP. Good with Skinning, but the Crit bonus from skinning is a weak stat for you. Escape artist has definite PvP use and situational PvE use. A bit harder to hit is of little value since you’re not the tank. Shadowmeld will drop aggro when things get tight and might allow hiding from patrols in dungeons if Stealth is not available. Increased speed while stealthed is a nice ability. +1% Haste by night and +1% Crit by day. The Human Spirit adds to your Versatility. “Every man for himself” has definite PvP use and occasional PvE use. Increased rep gain is nice for all that faction grinding that you’ll be doing. Stoneform decreases damage by 10% and washes away bleeds, but this wont be of much use in most PvE content. Warlords did away with all profession bonuses, so there is no longer any gain to any given professions other than toys, gear, or gold making. You can make some of your starting raid gear, which is cool. Blacksmithing for the weapons, leatherworking for the armor, and Engineering for the toys might be “the best” picks. You can equip three crafted items, weapons or armor. As these items are ilevel 630 and 640 respectively, and can be used at 91, they’re rather nice for Draenor leveling and starting your raiding career. You can also create items to reroll the stats on any crafted gear and you can also upgrade the items, at a much greater cost than what it took to make them. Need even more cash? Go here. Leatherworking – Make your own gear, give it to alts, or sell it. Blacksmithing – Make weapons to use, give, or sell. Jewelcrafting – Gems and jewelry. Alchemy – Chemistry for the improved lifestyle. Very nice trinket. Enchanting – Enchanters can now enchant rings and neck pieces. Inscription – Glyphs, shoulder enchants for everyone, items for our caster pals, fortune cards. Tailoring – You can make a nice flying carpet. Engineering – All kinds of toys, bombs, mounts, and nitro boosts. Herbalism, Skinning, and Mining are just for feeding other professions or making some gold. Fill in the name of the party member who will be the focus of your T of T. Fire it off, he gets the benefit, and you don’t have to fuss with target picking or focus changing. This macro will not deselect your current target. Note that this will allow you to attack a target a few seconds before the tank, and the tank gets the aggro. This one will target your mouseover target. This one will look for your mouseover target and cast tricks on it. If you have no mouseover then it will look for your focus target. If that fails then it will cast it on the target of your target, which is probably the tank and hopefully not you. Gouges your opponent then starts bandaging you. It will work even if you have no opponent. Change the bandage name to the one you’re using. You can also use Blind with this macro. Any attack that you will use to start a fight should be used with this macro. It ensures that your auto attack is actually running, even though you might not have the energy for the main attack. Useful for target switching. The [nostealth] command removes certain bar lag issues. Replace abilityname with your attack, such as Mutilate, Shiv, etc. Now you’re all ready to start assassinating the opposition, but you’re not yet high enough level to raid. To get there all you have to do first is complete thousands of quests and kill a bazillion mobs of all sorts. Just in case you don’t already have the entire leveling path memorized, might we suggest a full blown Rogue leveling guide? Sure, you can boost a character to 90, but you still have to hit those last ten levels. Dugi’s Guide is the solution. What it does is show you where to go and what to do for you entire leveling path, whether you’re starting from level 1 or 90. Quests and tasks are automatically updated as you complete them and not only will you never again wonder where you have to go you will not have to look up any of there “what do I need to do here…” stuff, it’s all in the guide. Dugi’s shows you what to do and where to go every step of the way, all the way, to level 110. Like to level in the dungeons and battlegrounds, as well as through questing? No problem! Dugi’s guide has been gemming for Int and is smart enough to always point you where you need to go next, regardless of how many levels you gained in the dungeons or by killing players. It’ll even clean up your obsolete quests. Allways updated for the latest patches and expansions, Dugi’s is like having and expert looking over your shoulder, pointing out the fastest way to the level cap. Get yours here and level fast. Outlaw DPS – Pistols, swashbuckling, and piracy, what’s not to like? Subtlety DPS – Even more subtle and shadowy than before. Assassination PvP – Yep, Assassins can murder players just fine, thanks. Outlaws in PvP – We’ll have to see about this one, but they have the tools. Subtlety – A brutal burst and Shadow Dance makes Sub the traditional PvP spec. Rogue overview – An overview of Rogue in general. See the above pages for more detail. Rogue Leveling – TIps and builds to level your Rogue faster. Other Rogue Posts – Our Rogue blog posts. I wish you would have gone into a little more depth as to why you think mastery is over versatility. Icy vines and noxxic have the same stat priority except that versatility and mastery are swapped. I’m curious as to how you came to this conclusion. Mostly because at the last update of the page I hadn’t quite updated that section. 2)it’s easier to stack a large chunk of Mastery than it is Versatility. I just did a little item swapping on an Assass. Rogue. X amount of Mastery points gives you a lot more than than same points in Vers. Check it on yours. 10% of each and I’d say go for Vers. If, for example, Mastery is half the damage value of Vers, 1% vs 1%, but you get 5x the Mastery for every point allocated, I’d say go with Mastery. edit: More comments in the stats box above. This page was extremly helpfull and full of information. I have tried a couple other websites for rogues and this one is the best that i found by far. Thanks for the info.